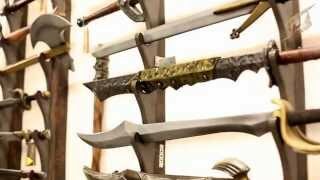 Epic Armoury LARP accessories add that extra touch of ambience for every character and costume. A scout is nothing without his telescope, an alchemist must have potion flasks, bags, and holders of different sorts, just as a rogue needs his cloak and thieves’tools to unlock the secret chest and hidden doors. Epic Armoury LARP accessories include more practical LARP equipment than you see anywhere else. It includes a wide selection of single items such as bottle holders to stay hydrated on the battlefield, cutlery for campfire dinners, a compass for the pathfinder, camp stools, fire pits, and even thermos holders. All the accessory items are manufactured in an authentic look, giving them that medieval feel to match the style and setting of fantasy LARP. Swing by and check out the Epic Armoury LARP accessory selection and browse the items that make your character unique and add that extra touch to your costume. We believe you will have fun when deciding what LARP “bling”will complete your character and costume.